Oh my goodness. How long have I wanted to make a mason jar lamp? A long time! I really needed a lamp for my craft room desk and this is perfect. What I especially love about it is the light it puts out. I’m using a GE LED Energy Smart 60 watt light bulb. It’s has super bright LEDs but puts out a wonderful warm colored light, my favorite. I followed this tutorial that I found on Pinterest, except that mine didn’t turn out that way. LOL! Hey, it happens, right? So, instead of this being a mercury glass mason jar lamp, it’s a shabby chic silver lamp. Oh well. I still love it. I used a mix of white vinegar (the tutorial calls for white wine vinegar) and water in my mister. I misted that onto the jar, then sprayed on silver metallic paint that I’ve had for years. I got interrupted in the middle of painting because the sprayer clogged. I had to go in and find a pin to open it up again. Thank goodness I’d not cleaned up from sewing. LOL! So, that could have also hampered my mercury glass look. 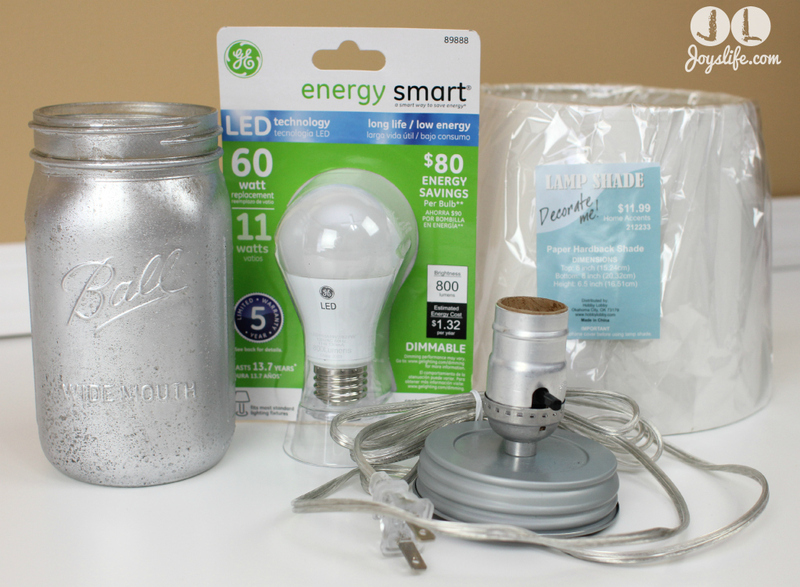 I bought a mason jar lamp kit adapter by Darice to quickly create my lamp. It’s so easy. You just screw the lamp adapter to the top of the jar! Now all I need to do is add the light bulb! Did you know that 1 LED Bulb lasts as long as 15 traditional incandescent bulbs? Yep. Guess what else? These bulbs can be dimmed. I’m so happy about that because I added a dimmer to my craft room and have to keep it on high because my current bulbs aren’t dimmable. I’m changing those to GE LED Energy Smart light bulbs this week. Plus, they put out great light but don’t put out heat. You can learn more about LED bulbs here. It was very easy to find the GE LED Energy Smart light bulbs at Target. They were right under the “Light Bulbs” sign! Easy. Don’t you love going to Target? I do. I found so many things that I needed. My basket included: sunglasses (mine broke just as I got in the parking lot), these light bulbs, coffee, a jump rope (because I embarrassed myself at the gym doing the rope “step over” instead of a jump…must…practice…at…home) and Easter items. I’m so glad I was in there because I’d totally forgotten to do any Easter shopping. Whew. That was close. Hi Joy, Wow, you're a girl of many talents, now an electrician. Your lamp is so cute, even with the delay. I didn't know about the mason jar lamp kit, makes life a whole lot easier, compared to when my Dad made one from a cookie jar. You did good girl. Blue Rose, I agree! That kit makes lamp making super easy! I can rewire a lamp but...if I don't have to...I'd like to pass on that. LOL! What a clever project, Joy! !